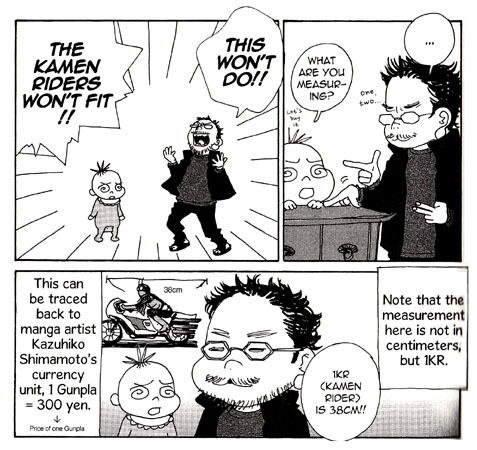 Moyoco Anno is a manga artist whose body of work stars everything from cutesy magical girls to red-light district courtesans to modern corporate women, and who happens to be married to fellow creative Hideaki Anno. 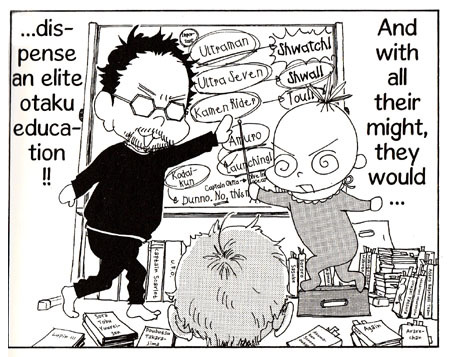 Anno the filmmaker is not only the postmodernist director of, among many other things, GAINAX’s Evangelion, but is also wholly committed to the full otaku lifestyle. Dominated by his obsession with the colorful, childish, giant-monster-infested Showa-era end of the entertainment spectrum, Hideaki Anno’s all-consuming otaku immersion has arguably led to a successful entertainment career, but has also has rendered him incapable of interacting with the “straight” world. Dragging him kicking and screaming into the real-life situations of marriage, home ownership, and other real-life grownup adult details is a daunting task for anyone. Especially when you’re inexplicably drawing yourself as a crazy-eyed toddler in footy PJs. 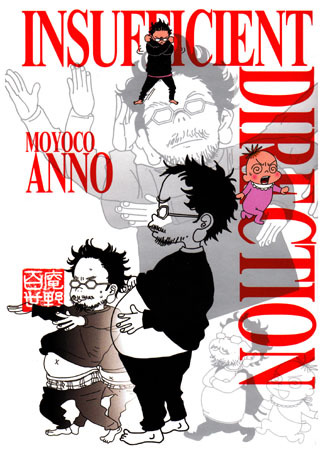 This is the premise of Moyoco Anno’s Insufficient Direction, a collection of short, sharp stories detailing the trials and tribulations of “Rompers”- Moyoco’s toddler stand-in- and her life together with “Director” as their differing lifestyle choices meet and clash. As a guy roughly in the same age range and sharing a lot of predilections as “Director”, it’s downright appalling to see him tooling along in the car singing along to the X-Bomber theme song. Because… I do that. I too was obsessed with Ultraman as a child and know way too much about super-robot cartoons and who directed what World Masterpiece Theater production of which juvenile literary classic, and it is profoundly unsettling watching my life unfold in a manga written and drawn by complete strangers who, so far as I know, are not spying on me. Still, the parallels are ominous. 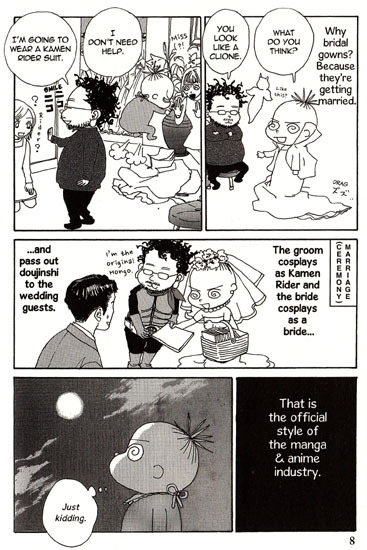 “Rompers” and “Director” were married, as my cartoonist wife and I were, in 2002 – and while neither groom sported a Kamen Rider costume, as shown in the manga, they DID distribute their own doujinshi to the guests (why didn’t we think of that?). The couple faces the same questions many of us face today; what to do with the piles of DVDs and LDs? How best to handle the pot belly that results from the sedentary otaku lifestyle? Where in their tiny apartment will the Kamen Rider figures go? How should a faithful wife react when – again, ominously paralleling my own life – she first sees her husband’s goofy amateur films? Thankfully for my own sanity, every time Insufficient Direction hits too close to home we come across a sequence where “Rompers” tries to convince “Director” that changing underwear and showering every day is critical, which I assure you is NOT an issue around HERE. 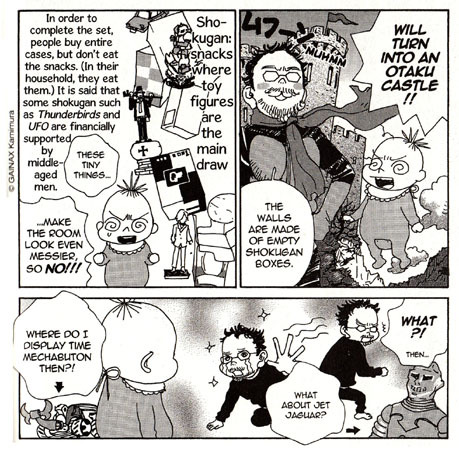 “Rompers”, a successful josei/seinen manga artist prior to her relationship with “Director”, is fascinatingly distant from the otaku lifestyle. In the West, comics have been the realm of fanboys-turned-pro for so long that the idea of comics professionals un-obsessed with fandom trivia is a novelty, but “Rompers” could care less about tokusatsu shows or quotable Char Aznable quotes… at first, anyways. Creative couples producing tag-team autobiographical comics are rare whatever hemisphere you’re in; the closest you’ll find to this work are perhaps the jam comics of Robert Crumb and Aline Kominsky-Crumb, and Insufficient Direction thankfully steers clear of Crumb & The Bunch’s more confessional tendencies. In the manga-artist autobio field, Insufficient Direction’s nearest sibling available here may be Hideo Azuma’s Disappearance Diary, which deals with altogether heavier subjects like alcoholism and depression while sidestepping any discussion of its effects on Azuma’s relationship. As Insufficient Direction and the couple’s relationship progresses, “Rompers” succumbs to some kind of otaku version of Stockholm Syndrome and starts peppering her speech with references to Akage no Anne while joining “Director” in belting out the Hurricane Polymar theme song. Will she become, finally, an Ota-Wife? Is this even a thing? How far should a spouse go in adopting the quirks of their partner? Can a manga really deal with the mysteries of the human heart and at the same time explain what an Ultra Bracelet is and why somebody would spend 140000 yen on one? For those not completely consumed by the otaku world, Insufficient Direction comes fully annotated with vital stats about Battle Fever J, Moomin, Super Girl Asuka, Xabungle, various Ultramen, the J-9 series, and otaku cultural icons like BIC Camera and Kourakuen Amusement Park. The book also does a pretty good job selling us on the “Smarty” infrared sauna. “Director” is given a lengthy postscript that hands us a lengthy, unflattering description of “otaku” and compliments his wife on nailing the subculture without giving the readers any mercy. Of course, as it says in the beginning of Insufficient Direction, “All characters appearing in this work are fictitious. Any resemblance to real persons, living or dead, is purely coincidental.” So don’t take it personally, otaku. Moyoco Anno’s direct linework carries a lot of information and her expressive characters are able to communicate every emotion in spite of being drawn as swirly-eyed babies or hidden behind Director-san’s glasses. Their Felix-and-Oscar relationship makes for entertaining reading no matter which side of the Otaku Divide you’re on, and this semi-autobiographical roller-coaster ride is just getting started; the anime version of Insufficient Direction premiered April 3 2014. We can only hope a new generation of obsessives will devote valuable brain cells to memorizing every detail of the life of “Rompers” and “Director”. Moyoco Anno will be appearing at the Toronto Comics Arts Festival May 10-11, 2014. Attendance is free. See you there!